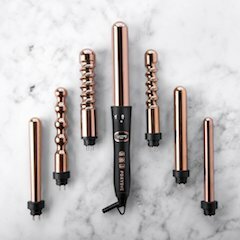 As the Mother of the Bride, it’s an exciting – and busy – time for you as you help your daughter prepare for her wedding. And even though your husband may make the Father of the Bride Wedding Speech, it’s entirely appropriate for you to make a speech of your own. Your Mother of the Bride wedding speech and toast to your daughter and her groom on their special day will be something she cherishes for years to come. Your wedding speech “theme” can draw upon the years of memories and experiences as you’ve watched your daughter mature into the beautiful woman she is today! • You might mention a favorite or amusing anecdote when your daughter was younger. • You might point out a special quality that makes you proud of your daughter. • You might describe what you admire about your daughter. For example, you might admire her spirit and tenacity for overcoming hardships, excelling in her studies, or rising rapidly in her profession. Our free report, The Mother of the Bride’s Wedding Speech Guide, gives you seven questions you can ask yourself to help you develop your theme. As a mother it’s appropriate to give guidance to the newlyweds drawn from your own marriage or experiences. A quotation…a saying…a proverb could all be used. Your wedding speech can be sentimental. It can be emotional. You can recall poignant moments. Or you can include a humorous story. 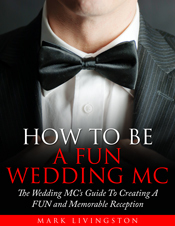 Introduce yourself to the wedding guests – unless the wedding MC does that for you. Welcome your guests. Be sure to thank everyone who has worked with you to plan and organize the wedding activities. The primary content of your speech will revolve around a “theme” you chose in the early preparation stages. Although your wedding speech is to honor your daughter, be sure to include the groom — not as an afterthought, but as part of your overall presentation. A formal welcome to the groom and a warm welcome to his family are also appropriate. Your speech will end with toasting the bride and groom. If you’re like most Mothers of the Bride you’ve been very busy arranging the wedding and wedding reception for your daughter. And as the deadline for the wedding approaches you probably find that you don’t have a lot of time to craft the type of Wedding Speech that is filled with the emotions that you feel towards your daughter. The quickest way to get inspiration for your Mother of the Bride Wedding speech is by using Wedding Speech Templates – pre-written Mother of the Bride Speeches that show you how to say your words of love and pride to your daughter on her special day. These Mother of the Bride Speech Templates not only include Wedding Speech examples but also toasts and jokes that you can include in your Wedding speech. A spur of the moment speech can be a disaster. That’s why it’s recommended you fine tune your speech as you practice it until it feels natural and flows easily. Time your speech to be no more than 5 minutes. That’s about 750 words. Anything longer could easily bore your wedding guests and lose their attention. Memorizing your speech can make it sound stilted and unnatural. Instead, commit to memory your beginning and ending lines, including the toast to the newlyweds. This simple – but effective – technique will calm your nerves and increase your confidence especially as you start your speech. What’s more, you’ll find it allows for a smoother transition to the toast. The Mother of the Bride wedding speech will have special meaning to your daughter. Spend time thoroughly preparing a tribute she’ll remember forever. (The website owner receives financial and/or other forms of compensation at no extra cost to you for products recommended or suggested, appreciates your support, and wishes you every joy and happiness on your daughter’s special day). 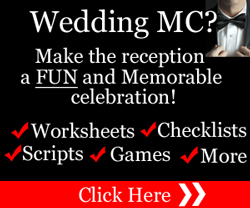 Looking for ideas for your wedding speech? 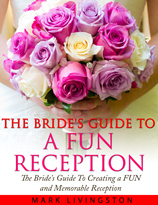 Get our FREE Special Report, The Mother of the Bride’s Wedding Speech Guide. You’ll discover the top 5 most important wedding speech tips, 7 questions to ask before you start preparing your speech, how to boost your confidence, and more. PLUS, 2 talents you might have that you can use in your wedding speech for an unforgettable presentation. 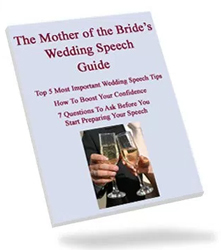 Get The Mother of the Bride’s Wedding Speech Guide right now (instant download).